The 2014/15 U.S. rice crop is projected at 213.0 million cwt (rough-basis), up 12 percent from a year earlier and the largest since 2010/11. The 23.1-million cwt projected increase in crop size is the result of a 16-percent expansion in planted area to 2.89 million acres. The 2014/15 average yield is projected at 7,468 pounds per acre, down 3 percent from a year earlier but still the second highest on record. By class, the 2014/15 U.S. long-grain crop is projected at 161.0 million cwt, an increase of 22 percent from a year earlier and the largest since 2010/11. Combined medium- and short-grain production in 2014/15 is projected at 52.0 million cwt, a decline of 10 percent from a year earlier and the smallest since 2008/09. Despite substantial progress over the past week, the pace of planting of the 2014/15 U.S. crop remains behind normal in most parts of the country, especially in the South, where an abnormally cool, wet spring has delayed planting. For the week ending May 4, 57 percent of the U.S. rice crop was planted, well behind the 5-year average of 65 percent but up 12 percentage points from a week earlier. Progress was still behind normal in parts of the Gulf Coast as well. Crop emergence is behind normal as well. For the week ending May 4, 39 percent of the 2014/15 U.S. rice crop had emerged, behind the U.S. 5-year average of 47 percent. Total U.S. supplies of rice in 2014/15 are projected at 264.3 million cwt, up 6 percent from a year earlier and the largest since 2010/11. In 2014/15, a larger crop and steady imports are projected to more than offset a much smaller carryin. By class, long-grain total supplies are projected at 197.3 million cwt, an increase of almost 15 percent from a year earlier and the largest since 2010/11. Total U.S. rice imports in 2014/15 are projected at 22.0 million cwt, unchanged from a year earlier and second only to the 2007/08 record of 23.9 million cwt. Long-grain imports are projected at 19.0 million cwt, up 3 percent from a year earlier and the highest on record. Combined medium- and short-grain rice imports are projected at 3.0 million cwt, down 14 percent from a year earlier but slightly above the 2009/10-2012/13 average. Total use of U.S. rice in 2014/15 is projected at 230.0 million cwt, up 5 percent from a year earlier. Both total domestic use (including a residual component) and exports are projected to be higher in 2014/15. Total long-grain use in 2014/15 is projected at 173.0 million cwt, an increase of 12 percent from a year earlier and the highest since 2010/11. For combined medium- and short-grain rice, total use is projected at 57.0 million cwt, a decline of 11 percent from a year earlier and the smallest since 2008/09. Total domestic and residual use of all rice in 2014/15 is projected at 128.0 million cwt, up 4.0 million cwt from a year earlier. Combined medium- and short-grain domestic and residual use is forecast at 27.0 million cwt, down 18 percent from a year earlier and the smallest since 1988/89. Total exports in 2013/14 are projected at 102.0 million cwt, up 7.0 million cwt from a year earlier. Long-grain U.S. exports are projected at 72.0 million cwt, an increase of 12.5 percent from a year earlier. By type, U.S. rough-rice exports are projected at 34.0 million cwt, up 1.0 million cwt from a year earlier. Long-grain accounts for the bulk of U.S. rough-rice exports. Combined milled- and brown-rice exports (on a rough basis) are projected at 68.0 million cwt, up 6.0 million cwt from a year earlier. U.S. ending stocks of all rice in 2014/15 are projected at 34.3 million cwt, up 17 percent from a year earlier. The medium- and short-grain carryout is projected at 7.7 million cwt, down 2.0 million cwt from a year earlier. The medium/short-grain stocks-to-use ratio is calculated at 13.5 percent, down from 15.1 percent in 2013/14. Both ending stocks and the stocks-to-use ratio for medium- and short-grain rice are the lowest since 1998/99. Expectations of a small carryout are expected to push prices higher in 2014/15. There were no revisions to the 2013/14 supply side estimates this month. On the use side, the 2013/14 U.S. export forecast was lowered 2.0 million cwt to 95.0 million cwt based on shipment data reported the U.S. Census Bureau through March, shipment and sales data reported in the weekly U.S. Export Sales through May 1, and expectations regarding shipments the remainder of the market year. Sales and shipments have been weaker than expected to Central America, Northeast Asia, and Sub-Saharan Africa. 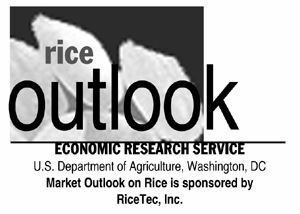 Combined milled- and brown-rice exports (on a rough-rice basis) are projected at 62.0 million cwt, down 2.0 million cwt from last month’s forecast and 15 percent below a year earlier. Both long-grain and medium- and short-grain export forecasts were lowered 1.0 million cwt, to 64.0 million cwt and 31.0 million cwt, respectively. The reduced 2013/14 U.S. export forecast raised total U.S. ending rice stocks 2.0 million cwt to 29.3 million cwt. Both the long-grain and medium- and short-grain ending stocks forecasts were increased 1.0 million cwt this month. The 2014/15 season-average farm price (SAFP) range for U.S. long-grain rice is projected at $13.50-$14.50 per cwt, down from a revised $15.20-$15.80 per cwt in 2013/14 and the lowest since 2011/12. The combined medium- and short-grain 2014/15 U.S. SAFP range is projected at $18.50-$19.50 per cwt, compared with a revised $17.70-$18.30 per cwt for 2013/14. The 2013/14 SAFP was lowered $2.00 per cwt on both ends based on monthly cash prices and marketings through April and expectations of prices and marketings the remainder of the market year.